Here is the starting lineups and pitching match-up for tonight's All-Star Game from Space Coast Stadium. First pitch is scheduled for 7:35 PM. Check back through-out the night to see how the Stone Crabs match up against the rest of the league all-stars. South Division leads off first inning with back to back singles by Quincy Latimore and Josh Satin. Henry Wrigley grounded out to score Latimore and give the South Division a 1-0 lead. An inning staring throwing error by Isaias Velasquez amounted to nothing to a double play and a strikeout to end the inning. South Divison still leads 1-0. No runs, 1 hit by Xavier Scruggs. South Division holds a 1-0 lead. North Division retired in order. South Division goes down in order. Isaias Velasquez grounded out to first. 1-0 South Division. Jack Rye led of the inning with a double with a shot to left field missed by the diving Richard Rocobaldo. Gustavo Nunez followed with a single. Brett Jackson singled to right, scoring Rye. Nunez scored on a force out by Travis d'Arnaud. North Division leads 2-1. South Divison goes down in order. Wrigley grounds out to second, 0-2 with an RBI. North Division leads 2-1. Three up, three down. North Division leads 2-1. Xavier Scruggs goes deep to tie game 2-2. Velasquez grounded into a double play to end the inning, 0-2. Two walks in the inning amount to nothing and the game remains tied 2-2. Neil Schenk pitched an inning, allowng no hits, 2 walks and struck out one to end the inning. Schenk threw 23 pitches in the inning, 13 strikes and 10 balls. South Division goes down in order. Still tied 2-2. Walk to Corban Joseph erased with inning ending double play. Game remains tied. Trevor May gives up a single to Xavier Scruggs but strikes out the side. Wrigley struck out swinging and is now 0 for 3 with an RBI. Seventh inning stretch time, tied 2-2. Back to back singles and an intentional walk loaded the bases. An error on the 5-4-3 double play allowed two runs to score and the North Division to take a 4-2 lead. Marquis Fleming allowed 2 runs on 2 hits with a walk in the inning. Fleming threw 21 pitches in the inning, 11 strikes and 10 balls. A single by Corban Joseph amount to nothing as Josh Satow takes over the mound to get the third out via strikeout. Game remains tied 4-4. Satow struck out the only batter he faced, we'll see if Morrison keep him in for the ninth. Xavier Scruggs drew a walk to lead off the inning but was left stranded. We head to the bottom of the ninth still tied 4-4. Velasquez struck out swinging to end the inning and is not 0 for 4 on the night. Satow remined on the mound. Jack Rye struck out to lead off the inning but reached first on a passed ball on strike 3. Rye was later erased from the basepath when Stephen Vogt redeemed himself by gunning down Rye on the steal attempt. Satow picked up his third strikeout to end the inning and force extra innings as we are still tied at the end of regulation. Satow now has 1 1/3 innings with no hits and 3 strikeouts. With the FSL rules, only one inning of extra innings will be played. If a winner can not be determined, the game will remain a tie. Quincy Latimore singled to lead off the inning. Josh Satin drove home the go ahead run with a single to right. The South loaded the bases but Xavier Scruggs hit into an inning ending double play to end the inning. We head to the last half inning of the game with the South holding a slim 5-4 advantage. Zach Quate will take over the mound in the bottom of the inning to try and nail down the win for the South. Quate struck out two and got the third to ground out, ending the inning and securing a 5-4 win for the South Division. South Division 5 runs on 14 hits with 3 errors. North Division 4 runs on 7 hits with 0 errors. 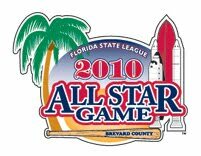 This wraps up the Rays Prospect's coverage of the 2010 Florida State League All-Star Game. Check back tomorrow for the wrap-up from the game. The game was not televised live. www.spacecoastbaseball.com will have video clips posted later today. Bright House Sports Network of Central Florida was also at the park and will air the game in its entirety throughout the week for those in the Central Florida region. For those that had family members in the game or would like to see the game, here is the e-mail address to them to inquire about purchasing a copy of last nights game Comments@catch47.com.